Abortion is condemnable for the same reasons that slavery and genocide are. History teaches us nothing if it doesn’t teach us that human beings have a great capacity for abusing other human beings. When this abuse is severe enough, and moves beyond the mistreatment of a few individuals, we call it a crime against humanity. Crimes against humanity generally refer to any large-scale atrocity committed against a group of innocent human beings. They are not crimes of passion, they are crimes of precision. They are not the result of accidental, momentary impulses, they are thought out and rationalized. The scale of such crimes cannot be carried out by individuals. They require the cooperation and consent of many, many people, and this is exactly what history shows us. The most notorious example, of course, is the Jewish Holocaust, in which six million European Jews were executed for their racial heritage. Raphael Lemkin (1901-1959), a Polish-Jewish lawyer, is the man responsible for making the annihilation of entire people groups an international crime. In 1933, influenced by his knowledge of the slaughter of Armenians by the Turks in WWI and the recent slaughter of Christian Assyrians by Iraqis, he appeared before The Legal Council for the League of Nations in Madrid and proposed to make the extermination of human groups an international crime, calling such crimes “acts of barbarism”. His proposal was not accepted. Ten years later, in 1943, he coined a new term, “genocide,” in an effort to more specifically describe the Nazi attempt to annihilate entire ethnic groups. (The term first appeared in publication in 1944 in his Axis Rule in Occupied Europe in a chapter titled: “Genocide”). The word “genocide” combines the Greek word for race (geno) with the Latin word for killing (cide). The Nuremberg trials, which concluded in 1946, used Lemkin’s term “genocide” in their indictment against top Nazi officials who were there convicted for “crimes against humanity”. In 1948, the United Nations officially made genocide an international crime at the Convention on the Prevention and Punishment of the Crime of Genocide. The Convention defined genocide as any of a series of acts designed to “destroy, in whole or in part, a national, ethnic-al, racial or religious group.” The acts listed include among others, causing serious bodily or mental harm to members of the group, imposing measures intended to prevent births within the group or forcibly transferring children out of the group. The deliberate and systematic destruction of a national, racial, religious, political, cultural, ethnic, or other group defined by the exterminators as undesirable. Such definition, in fact, is broad enough to include abortion, and some pro-life groups have made a compelling case that abortion is genocide. Abortion is certainly deliberate and systematic. 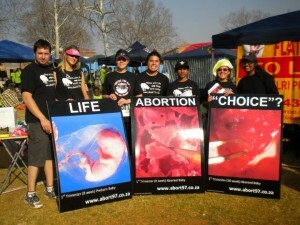 There is roughly one abortion for every eight live births in South Africa. Abortions are performed in a vast network of clinics around the country, with more than 200 a day and over 85,000 a year.. Furthermore, abortion targets a very specific group of human beings: unwanted, unborn children, a victim class that is defined by the pro-abortion mantra, “A World in Which Every Birth is Wanted”Their “final solution” for unwanted, unborn children is abortion. While the appropriateness of calling abortion “genocide” depends on what definition of genocide you are using, it is a plain and simple fact that abortion is the systematic destruction of millions of human beings. Genocide or not, abortion, like the Jewish Holocaust and like the treatment of non-whites in Apartheid South Africa, is a phenomena which dehumanizes a group of human beings so as to justify their elimination. This nation, and the world as a whole, has a sad legacy of dehumanizing people who have something we want or get in our way. The reason that some people take such offence at comparing abortion to past crimes against humanity is the same reason that the white establishment of America was scandalized when Dr. Martin Luther King compared the abuse of black Americans to the Holocaust. It is easy to condemn crimes that are far away (either by distance or time), it is much harder to condemn them when they sit right in your back yard. Abortion supporters are infuriated at the notion that abortion is comparable to the Holocaust because they incessantly argue that the unborn aren’t people. This is exactly the same argument that is always made to justify crimes against humanity.They’re not really people. This is what Hitler said. This is what South Africa said when it segregated the “non-white” people from the “white” people. If we can’t compare atrocities past to atrocities present, then the term “never again” loses all its meaning. At the end of the day, if the unborn are people (and they are), then abortion is not only comparable to past crimes against humanity, it is, by sheer volume, the greatest holocaust of all. Making a Person Property: For the second time in Supreme Court history, human beings have been made property.